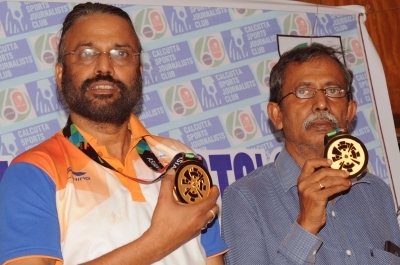 Kolkata Sep 15 (IANS) Pranab Bardhan and Shibnath De Sarkar who won the gold in bridge at the recently-concluded Asian Games were felicitated by the Tollygunge club on the sidelines of an invitational bridge tournament here on Saturday. Along with the duo bronze medal winner Debabrata Mazumder along with their coach and non-playing captain Debashish Roy were also acknowledged. Another bronze medal winner Sumit Mukherjee could not be present at the felicitation programme due to a prior engagement. Meanwhile Bangur Cement comprising former international Debashish Roy (captain) S.K. Ienger Uttam Gupta Kamal Mukherjee and Suman Mukherjee bounced back into the reckoning and finished at the top with 137.71 Victory Points (VPs) at the end of the ten-round Swiss league on the second day. Overnight leader Dakshin Kalikata Sangsad (DKS) could not repeat Friday s performance but finished second with 133.40 VPs.